A bit of a fluke? There are moments during the process of attempting to learn a particular skill, method or process when ones hopes are bolstered hugely by a result which exceeds ones expectations. Although these are fantastic moments to be savoured, they often come when we least expect them, they can be the harbingers of something of a very different nature. This picture today possesses one such moment. My “big smoke” theme threw up this image which demanded to be done and, as a further opportunity to practice my smoking tyre technique, I could not resist having a go. Heeding a kind of mental warning, stepping away from the airbrush seemed like a good plan, so focus turned very much to using a humble brush, a light wash and a layering approach to find a little more of the secret sauce. Suffice to say I’m much, much happier with the result which has some depth and texture, but maintains the cartoony feel of the picture. A rewarding result, but it could be a bit of a fluke. What is the point I’m attempting to make here? Well, it is this. When we experience an early success our confidence is rightfully buoyed, but what happens next rarely follows an upward trend, my next attempt at smoke was, to me at least, utterly rubbish. In a rare display of coyness I’m declining to show that today, suffice to say that I will doubtless get over it in a day or two and reveal the awful truth. In the meantime enjoy this one, it’s one of my better efforts I think. 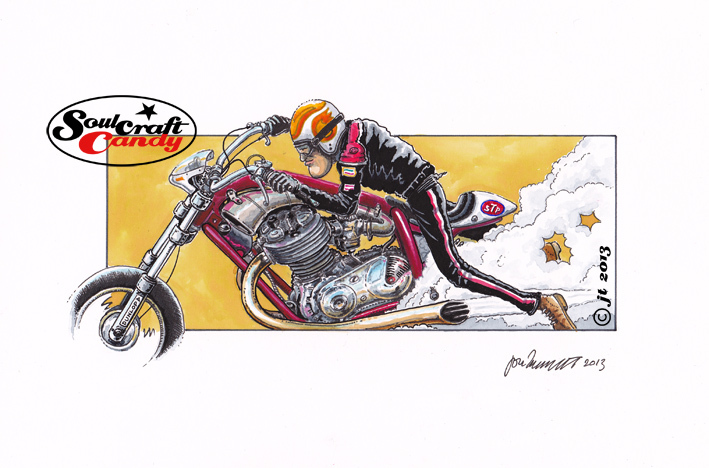 This entry was posted in Bike drawing, Cartoon, Colour, Creativity, Drawing, Motorcycle drawings, Pop, Scribbles, Self-criticism, Watercolour and tagged Bike drawings, Cartoon bike, finished drawings, illustration, ink drawings, Motorcycle Art, Motorcycle drawings, watercolour by Soulcraftcandyman. Bookmark the permalink.